Continuation of last week’s conversation. Make sure you recap. Lectionary skips ahead next week to 18:15, which is more about group dynamics. This leads into the Transfiguration. Jesus predicts his death, which leads directly into a revelation about his glory. Text is vague- what does it mean that Jesus began to show them? Perhaps he showed less concern over his own safety and survival than for sharing the good news? Satan is the great tempter- Is Jesus tempted to walk away from his path? Get behind me - rebuke or invitation? Peter’s reaction any different from many of us when the survival of the church is threatened or our own safety is threatened? Skandalon is something that would trip someone up on a path. When you think of old stone paths, some of the stones would be secure. Others would be loose and would cause someone to stumble. Not anti-Jewish: Matthew clearly identifies Jesus as the “Son of David” and the new Moses. Yes - especially if held together with what comes next - The Transfiguration. Crucifixion itself is not good news, but it is the path to reveal God’s true glory. Kingdom of God revealed through holding tension of shame of crucifixion and glory of resurrection. sacrifice? When was the last time you preached on sacrifice? This is not about daily annoyances. The term “this is my cross to bear is not to be used flippantly (or used to keep people in subjugation). New life only comes through death - we often offer new life but are loath to invite people to die- how can we do this while retaining the joy of the Good News? Skandalon - a stumbling block. Also the root of the word “Scandal.” The cross is a scandal and also the path to glory. To the worldly understanding of power, being subjected to death - even on a cross - is the ultimate expression of having no power. His willingness to die - this scandal - was his ultimate expression of love and power. If following Jesus is an invitation to new life - do we allow people to grieve their old life even as they step into the new? Sacrifice - what place does it have in today’s Churches? How do we invite people to both the good news of Jesus Christ and to the good news of sacrifice? What is more important survival or faithfulness? Do we justify the need to survive (a denominational, congregation, or individual) over being radically faithful? Should the church be a sanctuary-opened to all; or gathering hall - locked to non-leaders except for business hours? Skips Moses’ troubles with Pharoah. He was raised as a prince, apparently knew that he was a Hebrew. He fell out of favor after murdering an Egyptian who was treating a Hebrew harshly. “Moses is a lost soul.” Raised by Hebrew mother. Adopted by Egyptian princess. Murdered an Egyptian worker. Rejected by fellow Hebrews. Flees his homeland, and is identified as an Egyptian by the woman he soon marries. Now working for his father-in-law, his curiosity leads him to an incredible encounter. The ultimate call story. Moses going about his day-to-day business of tending the flock when he encounters something incredible. Moses’ curiosity draws him into the encounter. Not until Moses inquires about the strange fire does God intervene - and it is then revealed that it is not just a messenger of God, but God in the fire. God is clothed by the fire, but is not the fire. God’s presence is obscured by the created world, but God is intimately involved in the midst of that world. The holy ground was made holy by God’s presence. God is not limited by sites, shrines, temples. God has access to any where, and when God is there it is holy. “The ground is now holy because of God’s appearance, not because it was already holy. There is no holiness inherent in the place as such… That which is part of the natural order is sanctified, set apart for special use by God.” (Fretheim, p. 56). The act of sight is an important first step in the encounter. First, God sees. Then, Moses must see God. God appears to Moses (3:2). Moses tries to see the bush (3:3). Moses afraid to look (3:6). God says “I have observed the misery of my people…” (3:7). “I have seen how the Egyptians oppress them.” (3:9). The act of remembering and forgetting will be an important theme throughout Exodus, and the rest of the Hebrew Bible. God connects Moses to his past “God of your father, the God of Abraham, the God of Isaac, and the God of Jacob.” (Ex 3:6). When Moses asks about who to say sent him, God’s response ties the past and present together “I am who I am.” (3:14). Then God again recalls the tradition of the patriarchs (3:15). God’s Action: “I have come to deliver them from the Egyptians, and to bring them up out of that land to a good and broad land, a land flowing with milk and honey.” (3:8). “Without pursuing the endless critical opinions about the origin of the formula, it is enough to see that the formula bespeaks power, fidelity, and presence. This God is named as the power to create, the one who causes to be. This God is the one who will be present in faithful ways to make possible what is not otherwise possible.” (Brueggemann, p. 714). Don’t be afraid to tell your call story. No, preaching isn’t about the preacher, but it is a little. It is good to let people know - or even remind them - of how you were called to preach. Did you have a burning bush? Too many people think that call only comes through miraculous intervention. Fact is for most, call comes again and again. Someone might hear their own call through your story. And remember, the story skips over the part where Moses objects, bargains, and tries to get out of it, and God equips Moses to fulfill the call. “See and Remember.” When God saw the oppression of his people, he could no longer sit idly by. When sharing his identity, it was tied intimately with the past. Part of our role as people called by God is to see and remember. See the pain in the world that God would want us to heal, and remember that God is in our midst. Moses task seems great, and his objections are numerous and reasonable, but at each objection, God has an answer. Moses (like Peter in the above passage?) keeps thinking in human terms, fearful of failure and death. God though, is thinking as God, knowing that new life comes through death. The model behavioral covenant- Rochelle Stackhouse, Feasting on the Word. The current lack of cultural significance is, perhaps, something to be celebrated, not mourned as it forces us to “define” our identity and character. The life of faith is not an invitation into a community or a program, but an invitation to a way of life and being in the world. Dr. Paul Farmer’s Hermeneutic of Generosity, “means evaluating people's actions from an assumption that their motives are good even if, at first glance, one might suspect the opposite.” Rochelle Stackhouse, Feasting on the Word. How quickly to we jump to the assumption that someone’s motives are evil or mis-intentioned or simply wrong? What a small step it is from judging someone’s motive to judging the individual. The temptation of evil, The Lucifer Effect by Philip Zimbardo, “‘good people can be induced, seduced, and initiated into behaving in evil ways,’ especially when they submit to an authority that sanctions violence in particular situations” quoted by Christopher Hutson, Feasting on the Word. V.20 - what about heaping burning coals on the heads of our enemies - perhaps a purification of evil and oppression through love. Love which does not reject evil is not genuine. 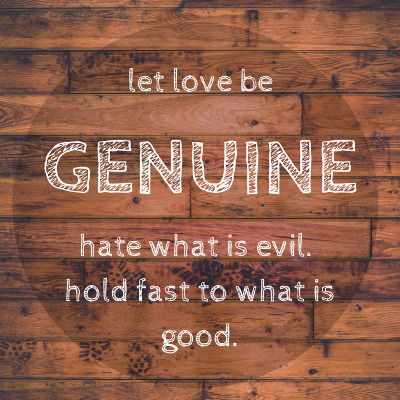 Genuine love must reject the systemic evils in our culture and society. This does not mean rejecting the individual, rather rejecting hateful ideology, language and actions that deny the humanity and prevents others from living fully and freely as God intended. How much of our focus on love, hope, blessing, serving and forbearance and how much is on buildings, budgets and bodies (members)? How might we bless the world and national leaders who are persecuting people- what would that look like?